One of the best of the Agastache varieties is Agastache ‘Sweet Lili’. 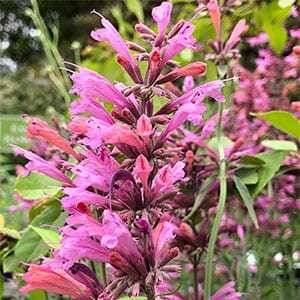 This is a brilliant pink flowering selection of the species Agastache aurantica. Tall spikes of pink flowers in profusion from spring through to autumn on tall spikes that make it standout in the garden. To add to the flowers, the foliage is scented with a lemon anise fragrance and is said to be used to make a herbal tea. Agastache are commonly called ‘Humming Bird Mint’, they do attract birds to the garden, along with bees and other insects. Mass plant 6 or so plants in the border for a dramatic effect. Mix Agastache ‘Sweet Lili’ with Echinacea, Salvia, Penstemon and other cottage garden plant for a great effect in the garden. Although tolerant of poor soils, ‘Sweet Lili’ will perform better in a humus rich soil with some moisture. Water in well with a liquid seaweed fertiliser after planting and water through the first summer. After it is established, this is a plant that requires little extra water or fertiliser to survive. You will find that some extra water and some applications of liquid seaweed fertiliser in spring and again in late summer will help prolong flowering. This is a variety that can be pruned back after the first flush of flowers to help promote a stronger second flush. Or just leave the plant to do its own thing. In winter you can prune A. ‘Sweet Lili’ back to the ground and it will bounce back in spring.